Taking the census in 1910 was just as difficult for census enumerators then as it is for today’s census workers. Click here to read the full story – 19 April 1910 – Seattle Daily Times. You can read what was happening today in history or any day over the past 300+ years. GenealogyBank has over 4,300 newspapers online and adds more every day! Join now and start digging for your family history. Read the stories of your ancestor’s lives in the historical newspapers – see history as they lived it. 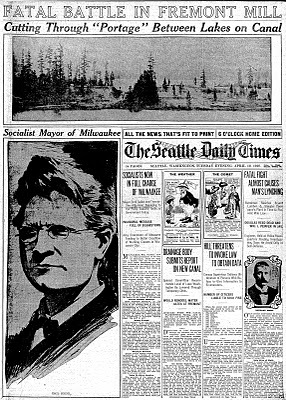 Click here to see a larger image of the 19 April 1910 Seattle Times front page. Where can I find Philadelphia death certificates?